This subject will be broken into a series of articles. We’ll examine both kinds of “Delivery” charges: Delivery or Manufacture of a Controlled Substance as well as Possession with Intent to Deliver a Controlled Substance. In my Criminal practice, I see these charges made in cases involving all kinds of substances, so we’ll also examine Delivery charges involving Narcotics and “Designer Drugs,” like Ecstasy, to those involving the Delivery or Manufacture of Marijuana. You don’t have to be a Criminal Lawyer to realize that a Delivery charge is serious business. Very often, at the time of Arrest, a person is confronted by the Police and asked to “help” themselves by “working.” In other words, the Police want the person to help bust other Dealers or Suppliers. Perhaps the biggest mistake anyone facing this situation makes is thinking the Police will just settle for getting names. In my nearly 20 years of handling cases and dealing with Undercover Narcotics Officers and Detectives, I have learned, as they so often tell a person willing to give up some names, that they already know most of those names. They want buys, or introductions. In other words, “working” means working, not talking. The Police will often try to impress on the person facing a Delivery charge how serious the matter is. Very often, they will remind the person of the maximum penalty under the law for such an offense. This, while technically true, ignores the fact that unless the person already has a really bad prior record, or there is a particularly large quantity of Drugs involved, they are unlikely to see much, if any, of that time behind bars. So, to set the stage, we can safely say that pretty much any charge involving Delivery is much more serious than any charge which involves simple Possession of a Controlled Substance. With that as a backdrop, it is important to point out that there are really two “kinds” of Delivery charges. The first, and more serious, is that which involves an actual Delivery of a Controlled Substance. 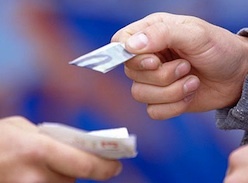 Most often, the person arrested has made a sale, or any number of sales, to an Undercover Narcotics Officer. These are called “hand-to-hand” buys, and really represent the “granddaddy” of all Drug charges. Like so many things, however, the law was gradually “stretched” and wound up being applied in situations that no one ever really thought of at the time it was enacted. Back some years ago, before the widespread availability of the kind of high-grade Marijuana that is so prevalent today, it was not uncommon for a person to carry two bags on them: One for “everyday” use, and then the “better” grade for special occasions. When found with 2 quarter-ounce bags, all of which was intended for personal use, the person would wind up facing a Possession with Intent to Deliver charge. This is an example of how the Law was “stretched” to apply to circumstances beyond the original intent at the time it was enacted. There really is no way to cover all the different scenarios in which a person could wind up facing one or the other of these charges. Suffice it to say that, if you’re reading this, there’s a chance that you, or someone you know, is in this boat. 2. “Possession with Intent to Deliver” a Controlled Substance. Most “Delivery” (or “Delivery/Manufacture”) charges are the result of actual Police buys from the person charged. While not as common, the same charge can be made if a person has even one lone Pot plant growing in or on their property. Most “Possession with Intent to Deliver” charges are the result of a decision, usually based upon the quantity or the separate packaging of drugs, to go above and beyond a simple “Possession” charge. In part 2 of this article, we’ll start looking at actual “Delivery” charges, and some of the considerations involved in handling them.